Blue skies, white clouds, beer, Leberkäs and Bretzen – Munich was at its best on Monday last, and participants in this year’s Munich International Summer University (MISU) were treated to a splendid reception. The MISU Summer Welcome Event, which has already attained the rank of a cherished tradition, was opened by LMU‘s Vice-President for International Affairs, Professor Ulrich Pohl, who welcomed the guests on behalf of the University. In the meantime, LMU has undoubtedly become a very popular destination for international students who retain their eagerness to learn even in the summer months. This year more than 500 of them, from no less than 80 different countries, are attending one or other of the many courses on the MISU program. This time around, the program lists subjects ranging from Holocaust Studies to Global Entrepreneurship to Life Sciences, and covers the whole gamut from Natural Sciences via Social Sciences to the Humanities. With the marvelous weather providing the perfect backdrop, and live music to add further color, the official Welcome Event gave its international guests an important introductory course – in Bavarian Gemütlichkeit. During their stay at LMU, the students also have a varied spectrum of sporting and leisure activities on their agendas, including excursions to Berlin or Salzburg, exhibitions and visits to the opera. 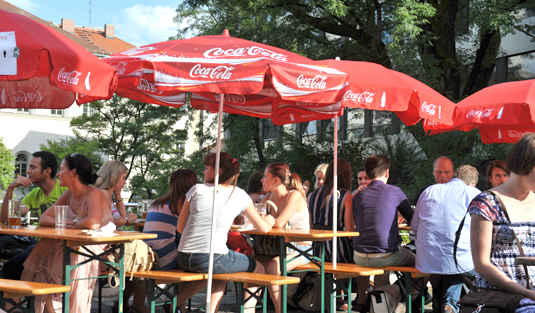 For further information on the Munich International Summer University, check out the MISU website.